home » news » at long last! It has been a very long time since you have heard from us, but we finally have some new jewelry! Fabricated while in the midst of commissions and over the course of many months, there isn’t a lot of cohesion to this collection, but perhaps the variety means there will be something to appeal to everyone. The July 2012 release includes a small selection of necklaces in both modern and tribal styles, two bracelets and one sparkly ring. As usual, many of the necklaces were made with 70cm dolls in mind: a natural horn pendant, a cold-forged sterling pendant, trade beads with Balinese silver, and even a fancy apatite and sterling necklace. Some other new materials make an appearance with this release; stainless steel braid cord, sea urchin beads, and some Japanese seed beads found during last year’s trip to Tokyo. St. James’ small scale macramé skills have improved, so we are excited to say that macramé will be featured in clasps again staring with this release. The two bracelets are both sterling silver but they are very different in character. The masculine turquoise cuff is inspired by the Navajo and the delicate bow bangle is designed for our most classy and feminine girl dolls. The faceted white topaz ring make another appearance as promised, this time in a much more elaborate floral setting. Some new dolls have joined our collection since we last sent out a newsletter, and you will see a few of them modeling: Kyros is a La Légend des Temps Roderich on a Dollshe Pure body. The Pure body has some more detail added to the torso sculpt, but the neck size remains the same as the old Dollshe body. 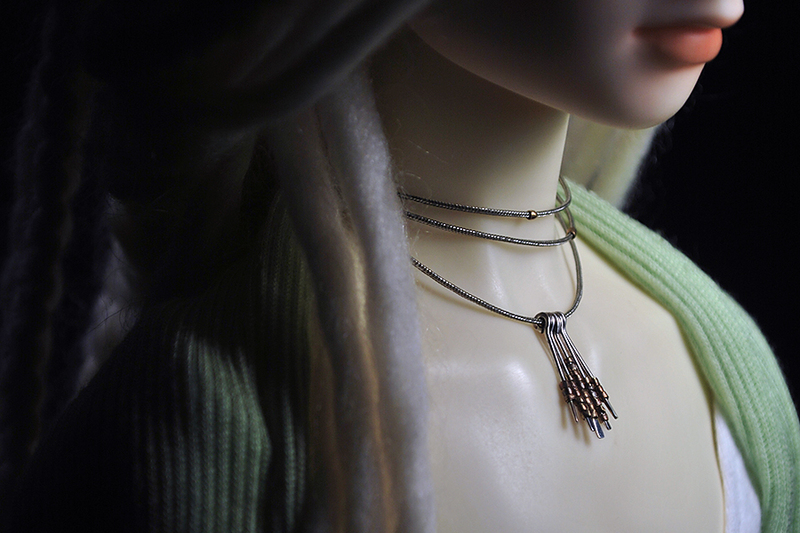 Dalziel is a Souldoll Souloid Iraki, and we put him in the smallest of the release’s necklaces as a reminder that minis can often wear our size Small jewelry. Nathan, idrisfynn’s Dollstown Mui is now sporting a much larger 18yr boy body. He is extremely tall but in girth he is about the same size as an iplehouse SID boy. We always love to hear from you, whether or not you feel compelled to buy anything this time around, and we are always interested in hearing about what you’d like to see us release in the future.